We previously demonstrated that a specialized subset of immature myeloid cells migrate to lymphoid organs as a result of tumor growth or immune stress, where they suppress B and T cell responses to Ags. Although NO was required for suppression of mitogen activation of T cells by myeloid suppressor cells (MSC), it was not required for suppression of allogenic responses. In this study, we describe a novel mechanism used by MSC to block T cell proliferation and CTL generation in response to alloantigen, which is mediated by the enzyme arginase 1 (Arg1). We show that Arg1 increases superoxide production in myeloid cells through a pathway that likely utilizes the reductase domain of inducible NO synthase (iNOS), and that superoxide is required for Arg1-dependent suppression of T cell function. Arg1 is induced by IL-4 in freshly isolated MSC or cloned MSC lines, and is therefore up-regulated by activated Th2, but not Th1, cells. In contrast, iNOS is induced by IFN-γ and Th1 cells. Because Arg1 and iNOS share l-arginine as a common substrate, our results indicate that l-arginine metabolism in myeloid cells is a potential target for selective intervention in reversing myeloid-induced dysfunction in tumor-bearing hosts. Mice that bear a large burden of transplantable tumors or that mount an intense immune response, such as that elicited by powerful recombinant viral immunogens, exhibit a generalized suppression of CTL anamnestic responses (1, 2). The immune dysfunctions in the CD8+ T cell compartment are at least partly determined by the accumulation of CD11b+/Gr-1+ myeloid suppressor cells (MSC)4 in secondary lymphoid organs and blood, a phenomenon related to the sustained level of GM-CSF produced by the tumor itself (2). Together with mature macrophages and granulocytes, the CD11b+/Gr-1+ population makes up a substantial proportion of immature myeloid precursors (3), and can also be detected under a variety of conditions associated with impaired immune reactivity to Ag challenge, such as overwhelming microbial infection, cyclophosphamide treatment, total lymphoid irradiation, superantigen-induced tolerance of CD4+ T lymphocytes, and others (reviewed in Ref. 4). Immature myeloid cells retain the inhibitory properties when cultured in vitro in standard medium, while the culture in the presence of cytokines or all-trans-retinoic acid eliminates their suppressive properties (3, 5). Immature myeloid cells, generated in large numbers in patients with squamous cell carcinoma, non-small cell lung carcinoma, and breast and head and neck cancer, have been shown to inhibit Ag-specific T cell responses in these patients (6, 7). In previous work, we isolated CD11b+/Gr-1+ cells from the spleens of immunosuppressed mice and immortalized the cells as a tool to dissect the molecular pathways involved in the differentiation of myeloid-related suppressors as well as the pathway used to inhibit T lymphocyte activation (8). Cloned populations of the immortalized cells express monocyte/macrophage markers, but differ from previously characterized macrophage lines in their capacities to suppress lymphocyte proliferation and cytotoxic responses induced by alloantigens and polyclonal activators such as Con A; moreover, the MSC lines also trigger the apoptotic cascade in Ag-activated T lymphocytes (8). We demonstrated that two different MSC clones (MSC-1 and MSC-2) inhibit mitogen-driven T cell responses by a NO-dependent mechanism (9); however, the same clones do not use this pathway to inhibit alloantigen-induced T cell proliferation, thus suggesting that multiple inhibitory pathways may coexist in MSC. To further characterize the inhibitory pathway, we selected the MSC-2 clone which most closely reflects the freshly isolated MSC population, because its suppressive properties are strongly enhanced upon exposure to mouse IL-4 (2, 3, 8); this feature offered us the possibility to compare the gene expression profile of IL-4-treated and untreated cells, in search of the molecules underlying the MSC-2-dependent suppression of alloreactive T cells. Preliminary analysis of RNA expression by DNA microarray technology (V. Bronte, unpublished data) pointed to the liver-type arginase as the most highly expressed gene in MSC-2 after exposure to exogenous IL-4. There are two distinct isoenzymes of mammalian arginase encoded by separate genes: type I arginase (Arg1), a cytosolic enzyme, is highly expressed in liver as a component of the urea cycle and is induced by Th2 cytokines in macrophages and dendritic cells, while type II arginase (Arg2), a mitochondrial enzyme, is expressed at lower levels in kidney, brain, small intestine, mammary gland, and macrophages, with little or no expression in liver (10). 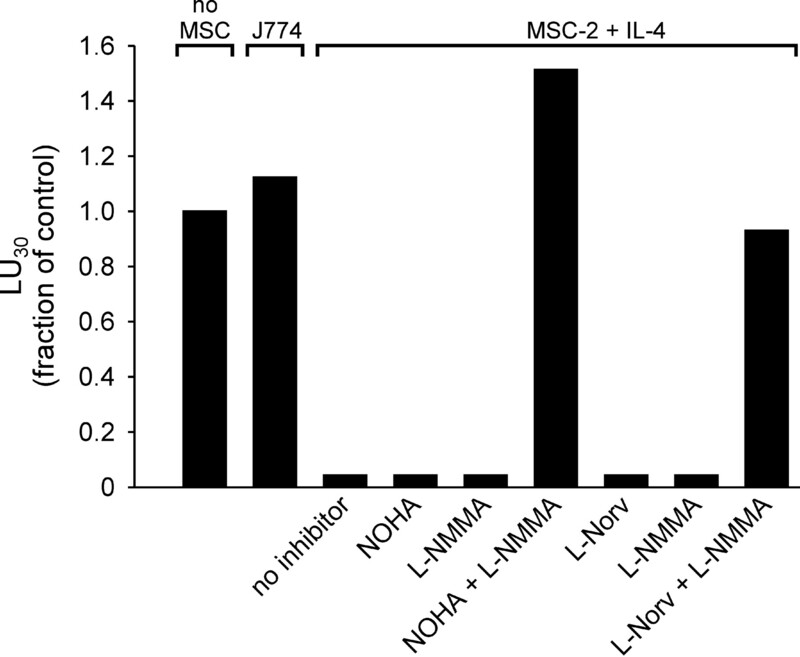 The second isoform was not present in IL-4-treated MSC-2. We thus concentrated our attention on the possibility that Arg1 could be involved in the suppressive activity of MSC. In this study, we show that IL-4-treated MSC-2, as well as myeloid cells from tumor-bearing mice, use an Arg1-dependent mechanism to inhibit alloreactive T cells, and that NO and Arg1 can act synergistically in this inhibitory pathway. CT26, a BALB/c carcinogen-induced, undifferentiated colon carcinoma, and MBL-2, a Moloney virus-induced lymphoma, have been described (2). C26-GM cell line was derived from the C26 colon carcinoma genetically modified to release GM-CSF. Briefly, GM-CSF cDNA obtained by RT-PCR from Con A-stimulated murine blasts was cloned into the LXSN retroviral vector, as described (11), and used to infect C26 cells. C26-GM cells used in this study produced GM-CSF at levels of 10–15 ng/ml from 106 cells in 48 h. J774 and RAW 264.7 macrophages, NIH-3T3 fibroblast, and 293 human embryonal kidney lines were purchased from the American Type Culture Collection (Manassas, VA). Cell lines were maintained in DMEM (Invitrogen, Carlsbad, CA) supplemented with 2 mM l-glutamine, 10 mM HEPES, 20 μM 2-ME, 150 U/ml streptomycin, 200 U/ml penicillin, and 10% heat-inactivated FBS (Invitrogen). MSC-2 line was immortalized and cloned as previously described (8) and maintained in RPMI 1640 (Euroclone, Wetherby, U.K.) supplemented with 2 mM l-glutamine, 10 mM HEPES, 150 U/ml streptomycin, 200 U/ml penicillin, and 10% heat-inactivated FBS (BioWhittaker, Walkersville, MD). C57BL/6, DBA/2, and BALB/c mice (8-wk old) were purchased from Charles River (Calco, Como, Italy). IL-4-knockout mice (IL-4−/−, BALB/c-Il4tm2Nnt) were purchased from The Jackson Laboratory (Bar Harbor, ME) as homozygote breeding pairs and maintained at the Istituto Nazionale Tumori animal facility. Procedures involving animals and their care conformed to institutional guidelines that comply with national and international laws and policies. N-hydroxy-l-arginine (NOHA) and NG-monomethyl-l-arginine (l-NMMA; Calbiochem, San Diego, CA) were used at 500 μM, l-norvaline (Calbiochem) was used at 5 mM (added at day 0 and day 2), and diphenyleneiodonium (DPI; Cayman Chemicals, Ann Arbor, MI) was used at 1 μM. All final concentrations were initially determined in titration experiments as the highest amount of inhibitor not affecting control cultures. Recombinant mouse IL-4 and IFN-γ (PeproTech, Rocky Hill, NJ) were resuspended in PBS containing 1% mouse serum (Sigma-Aldrich, St. Louis, MO). Recombinant human IL-2 (Eurocetus-Chiron, Milan, Italy) was resuspended in RPMI 1640 with 20% FBS. Arginase activity was measured in cell lysates as described by Munder et al. (12), with slight modifications. Briefly, cells were lysed with 50 μl of lysis buffer (0.1% Triton X-100, 100 μg/ml pepstatin, 100 μg/ml aprotinin, and 100 μg/ml antipain). After 30 min on a shaker at 37°C, 60 μl of 25 mM Tris-HCl and 2 mM MnCl2 was added. Arginase was activated by heating the solution for 10 min at 56°C. l-Arginine was hydrolyzed by incubating the lysate with 100 μl of 500 mM l-arginine (pH 9.7) at 37°C for 60–120 min. The reaction was stopped with 800 μl of H2SO4 (96%)/H3PO4 (85%)/H2O (1:3:7). The urea concentration was measured at 540 nM after addition of 40 μl of α-isonitrosopropiophenone (dissolved in 100% ethanol), followed by heating at 95°C for 15–40 min. Data (derived from three replicate wells) are given as milliunits of arginase/106 cells, where 1 U of arginase is defined as the amount of enzyme that catalyzes the formation of 1 μg of urea/min. NO was measured based on the Griess reaction as the amount of NO3− and NO2− produced using a nitrate/nitrite assay kit (Cayman) according to the manufacturer’s instruction. Results were normalized to 106 cells. Data are from triplicate wells. Superoxide production was measured by Tiron-inhibitable conversion of nitroblue tetrazolium (NBT; Sigma-Aldrich) to formazan. Cells subjected to various treatments were plated at 2 × 105 cells/well in a 24-well plate (BD PharMingen, San Diego, CA) with 1 ml of DMEM, and incubated for 18 h at 37°C in 5% CO2. At the end of the incubation, NBT (0.5 mg/ml in DMEM) was added for 1–8 h. After washing with PBS/1% BSA, cells were harvested and counted, and pellets were dissolved in 100% pyridine. Light absorbance was measured at 540 nm, and NBT reduction to formazan was calculated as follows: A × V/(T × E × L × C), where A is absorbance, V (milliliters) is the volume of solubilizing solution, T (hours) is the time of incubation with NBT, E is the extinction coefficient (0.72 mM−1 × mm−1), L (millimeters) is length of light travel through the solution, and C is the number of cells. Values were derived from quadruplicate wells. Total RNA was isolated using RNAFast (Molecular Systems, San Diego, CA), and 2 μg was mixed with 200 U of Moloney murine leukemia virus reverse transcriptase, 500 ng of 15–18 oligo-dT primers, 20 U of RNaseOUT, and 500 μM dNTP (Invitrogen), and incubated at 42°C for 1 h. One-tenth of the reaction volume was used as a template for PCR with the following Arg1-specific primers: Arg-1 sense, 5′-CAG AAG AAT GGA AGA GTC AG-3′, and Arg-1 antisense, 5′-CAG ATA TGC AGG GAG TCA CC-3′. After 5 min of initial denaturation, PCR was performed using recombinant Taq-DNA polymerase (Invitrogen) in 27 amplification cycles (95°C for 15 s, 57°C for 15 s, and 72°C for 15 s) with a final extension at 72°C for 5 min in a PTC-200 Peltier thermal cycler (MJ Research, Waltham, MA). One-tenth of the reaction volume was run on a 1.5% agarose gel. Cells (106) were harvested and washed twice with PBS, and the pellet was resuspended in PBS with 0.2% Triton X-100 and 2 mM EDTA, and incubated for 10 min at room temperature to allow cell membrane lysis. Lysates were centrifuged at 14,000 rpm for 1 min, and 1 vol of Laemmli’s sample buffer (4% SDS, 20% glycerol, 10% 2-ME, 4 mg/100 ml bromophenol blue, and 125 mM Tris-HCl; pH 6.8) was added to the supernatant. After incubation at 95°C for 10 min, lysates were subjected to SDS-PAGE, and proteins were electro-transferred to nitrocellulose membranes. After overnight saturation at 4°C in PBS/0.05% Tween 20 containing 2% nonfat milk (Sigma-Aldrich), membranes were incubated for 1 h at room temperature with rabbit anti-Arg1 antiserum (a kind gift of M. Mori, Kumamoto University School of Medicine, Kumamoto, Japan). Filters were washed twice with PBS/0.05% Tween 20, and incubated with HRP-linked donkey anti-rabbit Ig (Amersham Biosciences, Little Chalfont, U.K.) for 1 h at room temperature. Proteins were detected using the Supersignal West picochemiluminescent substrate kit (Pierce, Rockford, IL) according to the manufacturer’s instructions. A recombinant modified vaccinia virus Ankara (MVA) expressing mouse Arg1 was constructed using described methodology (13). Arg1 was isolated from total RNA extracted from MSC-2 exposed to IL-4. Briefly, total RNA was retrotranscribed using SSII (Invitrogen). The amplified product was cloned using the Topo-TA cloning kit (Invitrogen), subcloned in expression vector pcDNA3 (Invitrogen), and checked for function by transient transfection of 293 cells (data not shown). Arg1 gene sequence was then isolated from pcDNA3-Arg1 by digestion with EcoRI, treated with Klenow enzyme, and ligated into the PmeI site of pIIIdHR-P7.5 plasmid. MVA-infected chicken embryo fibroblast (CEF) cells transfected with pIIIdHR-P7.5-Arg1 allowed formation of recombinant virus MVA-Arg1, which was isolated by transient growth selection upon infection of RK-13 cell monolayers. Virus clones were amplified in CEF cells, purified through sucrose cushion, and plaque-titered in CEF cells using vaccinia virus-specific immunostaining. BHK-21 cells infected with MVA-Arg1 demonstrated synthesis of recombinant arginase protein in arginase assay and immunofluorescence using anti-Arg-1 antiserum (data not shown). For infection, 2 × 106 cells in single suspension were coincubated for 3 h with 108 PFU of MVA-Arg1 or MVA-enhanced green fluorescent protein (EGFP) (control virus producing Aequorea victoria green fluorescent protein) in 1 ml of medium at 37°C in a 5% CO2 atmosphere. Cells were washed twice, incubated in complete medium for 24 h, and then tested for arginase activity, NO, or O2− production. Arginase activity, assayed 24 h after infection of NIH-3T3, MSC-2, and RAW 264.7 cells with MVA-Arg1, was 100, 53, and 20 mU/106 cells, respectively. Allo-MLC were set up as described with slight modifications (8). Splenocytes (3 × 106) from 8- to 12-wk-old female BALB/c mice (H-2d) were incubated with an equal number of gamma-irradiated C57BL/6 splenocytes (H-2b) and 3% (of the total number of cells) gamma-irradiated MSC or J774 control cells in 24-well plates in a total volume of 1 ml/well with or without inhibitors. Both MSC-2 and J774 cells are derived from BALB/c mice and, therefore, are syngeneic to the responder cells in the allo-MLC. After 5 days, cultures were tested for ability to lyse allogenic target (MBL-2) in a 5-h 51Cr-release assay using 2 × 103 target cells previously labeled with 100 μCi of Na251CrO4 for 60 min. Percentage of specific lysis was calculated from triplicate samples as follows: (experimental cpm − spontaneous cpm)/(maximal cpm − spontaneous cpm) × 100. Lytic units (LU) were calculated as the number of cells giving 30% specific lysis of 2 × 103 allogenic target cells (MBL-2)/106 effector cells (LU30/106 cells). When present, nonspecific lysis of CT26 control targets was subtracted. LU30/106 cells were then used to calculate LU30 per culture from the number of viable cells recovered in the cultures. The LU30 fraction was calculated as follows: LU30 experimental group/LU30 control group. BALB/c splenocytes (7.5 × 105 cells/well) were cultured in 96-well flat-bottom plates (BD Falcon Labware, Franklin Lakes, NJ) and stimulated with an equal number of gamma-irradiated C57BL/6 splenocytes. Various numbers of gamma-irradiated MSC-2 or J774 cells were added in a total volume of 200 μl/well of medium with or without inhibitors. After 3 days of incubation, cultures were pulsed with 1 μCi/well [3H]TdR (PerkinElmer Life Sciences, Boston, MA) for 18 h, and [3H]TdR incorporation was measured by scintillation counting. Alternatively, BALB/c splenocytes (4 × 105 cells/well) were stimulated with 5 μg/ml Con A (Sigma-Aldrich) in the presence of gamma-irradiated MSC or J774 cells. After 2 days of stimulation with Con A, cells were pulsed with [3H]TdR. Data are expressed as cpm (mean ± SE) of triplicate cultures. Th clones were a gift from F. Fallarino (Perugia University, Perugia, Italy) and T. F. Gajesky (University of Chicago, Chicago, IL). The following two I-Ad-restricted, OVA-specific CD4+ T cell clones were used: the Th1 clone, PGL10, and the Th2 clone, PL104 (14). Clones were cultured in DMEM supplemented with 5% FBS and were maintained by weekly passage with gamma-irradiated DBA/2 syngeneic splenocytes, OVA (100 μg/ml; Sigma-Aldrich), and IL-2 (20 U/ml). Before use in experiments, T cells were purified by centrifugation over Ficoll-Hypaque. In coculture experiments, MSC-2 were plated at 2.5 × 105 cells/well in 24 flat-bottom plates (BD Falcon Labware) and coincubated with 5 × 105 Th1 or Th2 clones in complete DMEM added with IL-2 and OVA. After 24 h, nonadherent cells and supernatant were removed. Adherent cells were washed once with DMEM, harvested, lysed, and used for arginase assay; supernatants were centrifuged and used for nitrite determination assay. Spleens were depleted of red cells by incubation in NH4Cl lysis buffer, resuspended in complete medium, and 3 ml of splenocyte preparation (∼2.5 × 107 cells) was placed in 60-mm petri dishes (Falcon 1016; BD Falcon Labware) previously washed with 0.15 M NaCl. After 72 h at 37°C, petri dishes were washed and remaining adherent cells were detached by gentle pipetting with a solution of PBS/2 mM EDTA. In some experiments, CD11b+ splenocytes were isolated with CD11b mAb-coated magnetic beads on magnetic columns (Miltenyi Biotec, Bergish Gladbach, Germany) according to the manufacturer’s instructions. Rat mAb recognizing NLDC-145 (DEC-205) and F4/80 were purchased from BMA Biomedicals (Augst, Switzerland). FITC-labeled rat anti-mouse Ly-6G was purchased from AMS/Immunokontact (Gr-1; Bioggio, Switzerland). FITC- or PE-labeled mAb recognizing mouse CD3, CD8, CD11b, CD45R/B220, CD11c, CD86 (B7-2), anti-H-2 I-Ed/I-Ad (class II MHC), and the isotype-matched controls were purchased from BD PharMingen. The mAb 2.4G2 (CD16/CD32; American Type Culture Collection), which recognizes the extracellular domain of mouse Fcγ-RII and -RIII, was purified from mouse ascites. Cells were blocked with rat 2.4G2 purified mAb before staining with different amounts of mAb (1–10 ml/106 cells). Cell surface phenotype analysis was conducted using a Coulter XL Flow Cytometer (Beckman Coulter Electronics, Hialeah, FL) equipped with a 488-nm argon ion laser (Coherent, Innova laser, Santa Clara, CA) run at 15 mW. IL-4-pretreated MSC-2 added to Con A-stimulated T cells potently blocked in vitro proliferation, with as little as 3% MSC causing complete suppression (Fig. 1⇓A). J774, a cell line derived from splenic macrophages, did not show this inhibitory activity, suggesting that a metabolic effect was not responsible for the altered T lymphocyte growth, as previously demonstrated (8). Moreover, IL-4 did not modify the properties of J774 cells (not shown), likely because these cells do not express the α-chain of the IL-4R (8). MSC-2 use NO-dependent and -independent mechanisms to suppress T lymphocyte proliferation. A, Suppression of mitogen-induced T cell proliferation is NO dependent. BALB/c splenocytes were stimulated with Con A alone (none) or in the presence of 3% of gamma-irradiated MSC-2 pretreated with IL-4 (100 ng/ml) for 2 days. The nonsuppressive J774 macrophage line was used as negative control. Cultures were set up in the absence (▪), or presence of either 0.5 mM of the iNOS inhibitor l-NMMA (▦) or 0.5 mM of the inactive enantiomer d-NMMA (□). Splenocytes were cultured for 2 days and DNA synthesis was measured in [3H]TdR incorporation assay. B, Suppression of alloreactive T lymphocyte proliferation is NO independent. Responder BALB/c (H-2d) splenocytes were stimulated with gamma-irradiated allogenic C57BL/6 (H-2b) splenocytes (responder to stimulator ratio of 1:1), either alone (none) or in the presence of 3% gamma-irradiated IL-4-pretreated MSC-2 or untreated J774 cells. Inhibitors were added on day 0 at the same concentrations as in A. [3H]TdR was added on day 4, and incorporation was measured on day 5. Results are given as mean (±SE) of triplicate wells and were confirmed in three additional independent experiments. The addition of a selective inhibitor of NO synthase (inducible NO synthase (iNOS)), l-NMMA, at a concentration previously demonstrated able to block NO production in culture (9), completely abrogated the MSC-mediated inhibition of Con A-induced proliferation, while the inactive enantiomer d-monomethyl-l-arginine (d-NMMA) had no effect. However, when allogenic mixed leukocyte cultures (allo-MLC) were considered, the addition of l-NMMA was not able to reverse the suppression of alloreactive T cell proliferation induced by the presence of MSC-2 (Fig. 1⇑B); notwithstanding, NO production was detected in both allo-MLC and Con A-stimulated cultures when third party MSC-2 were added (data not shown). Thus, MSC suppression of alloreactive T lymphocytes seems to occur by a NO-independent mechanism, whereas inhibition of mitogenic responses may require NO. Mouse macrophages can express both Arg1 and Arg2, but only the Arg1 isoform is induced by Th2-associated cytokines such as IL-4, IL-13, or IL-10 (12, 15). l-Arginine is the substrate for both arginase and iNOS and is converted to urea and l-ornithine, and to NO, respectively, by these enzymes (16). 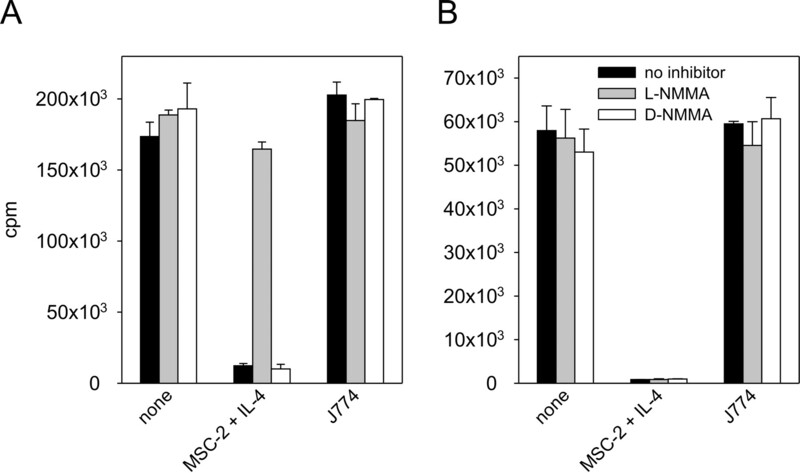 Arg1 mRNA and protein were not detected in J774 macrophages or unstimulated MSC-2, but both were up-regulated in MSC-2 after 24-h exposure to IL-4 (Fig. 2⇓). This up-regulation paralleled a change in the enzyme activity, and a detectable arginase enzyme activity was present only in lysates obtained from IL-4-pretreated MSC-2 (Fig. 2⇓, bottom panel). No Arg1 mRNA and protein expression nor arginase activity could be evidenced in control J774 cells (Fig. 2⇓). MSC-2 express Arg1 following exposure to IL-4. J774 cells, and MSC-2 grown for 24 h in standard medium or medium containing 100 ng/ml of IL-4 were analyzed for Arg-1 mRNA and β-actin (β-act) expression by RT-PCR (top panels), protein expression by Western blot (third panel), and enzyme activity based on the amount of urea released from cell extracts (bottom panel). Data are from one of six experiments with superimposable results. To assess the involvement of Arg1 in alloreactivity suppression, we used a physiologic inhibitor of the enzyme. NOHA, a stable intermediate product formed during conversion of l-arginine to NO by iNOS, is a naturally occurring inhibitor of arginase (17). NOHA and l-NMMA, either alone or in combination, were added to allo-MLC in both the presence and the absence of IL-4-pretreated MSC-2, and cytotoxic activity against the alloreactive target was assessed. Evaluation of LU represents a more effective measure than either proliferation assay or single E:T ratio cytotoxicity value, because it includes an estimation of both functional activity (cytolytic activity of cultures) and cell proliferation (number of cells recovered in each culture). Interestingly, while neither NOHA nor l-NMMA was sufficient to restore the cytolytic response, the combination of the two inhibitors was fully effective (Fig. 3⇓), suggesting the involvement of both arginase and iNOS pathways in the suppression of alloreactive T cells. As expected from the proliferation experiments, addition of J774 cells did not affect the generation of alloreactive CTL (Fig. 3⇓). Arginase and iNOS inhibitors abrogate inhibition of alloreactive T lymphocytes by MSC. IL-4-pretreated MSC-2 (MSC-2 + IL-4) and J774 cells were gamma-irradiated and added at a final concentration of 0.18 × 106 cells (3%) to an MLC consisting of 3 × 106 BALB/c splenocytes and 3 × 106 gamma-irradiated C57BL/6 splenocytes. NOHA (0.5 mM), l-NMMA (0.5 mM), and l-norvaline (5 mM) in different combinations were added to cultures on the same day. After 5 days, cytotoxic activity in the cultures was tested in a 5-h 51Cr-release assay against either a syngeneic control target (CT26, H-2d) or an allogenic target (MBL-2, H-2b), at E:T ratios starting at 100:1 followed by 3-fold dilution (100:1, 33:1, 11:1, and 3:1). LU30, defined as the number of lymphocytes necessary to achieve 30% specific lysis of 2 × 103 MBL-2 target cells in a 5-h assay, were calculated based on the total number of viable cells recovered from the cultures. Data are expressed as the ratio between the LU30 measured in cultures containing the third-part cells and in control cultures set up in the presence of the various inhibitors (no MSC; absence of added third-part cells and inhibitors was assigned the value 1). Data are from one of eight experiments with superimposable results. Because NOHA is also a substrate for iNOS, the requirement for an additional iNOS-specific inhibitor to overcome MSC-2-driven suppression might depend solely on the artificial increase of NO production via excess NOHA. l-Norvaline, which is neither a substrate nor an inhibitor of iNOS, is a useful tool for studying the interplay between arginase and iNOS (18). The combination of l-norvaline and l-NMMA blocked the MSC-2-dependent suppression (Fig. 3⇑), further implicating both Arg1 and iNOS in the suppressive pathway. Th2 cells and their associated cytokines induce the Arg1 expression in bone marrow-derived macrophages and dendritic cells (12). Moreover, CD4+ T cell-derived cytokines regulate a competitive balance in the expression of Arg1 and iNOS in macrophages, because Thl-type cytokines induce iNOS while they inhibit Arg1, whereas the reverse is true for Th2-type cytokines. Thus, we asked whether MSC-2 is subjected to a similar control, by evaluating the effects of coculture of these suppressor cells with Th1 or Th2 clones on both enzyme activities. As shown in Fig. 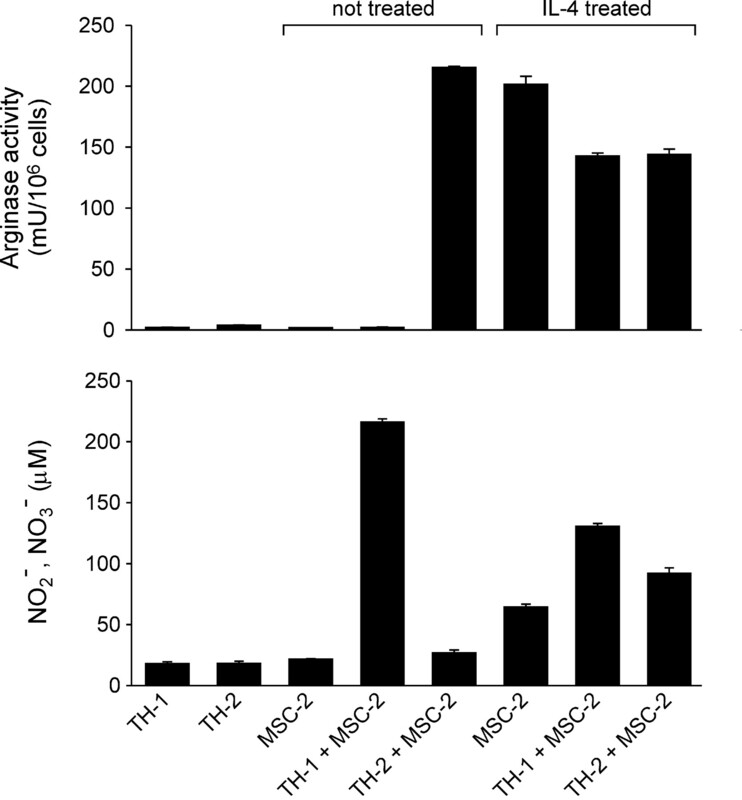 4⇓, the incubation of MSC-2 with the Ag-activated Th1 clone induced up-regulation of NO production, while the activated Th2 clone preferentially boosted arginase activity (Fig. 4⇓). Unexpectedly, a 48-h exposure of MSC-2 to IL-4 (experimental conditions used throughout this study) led to a significant increase in both arginase activity and NO production that could not be shut down by the activity of either Th1 or Th2 clone (Fig. 4⇓). Thus, IL-4-stimulated MSC appear to be unique in the simultaneous induction of Arg1 and iNOS activity. 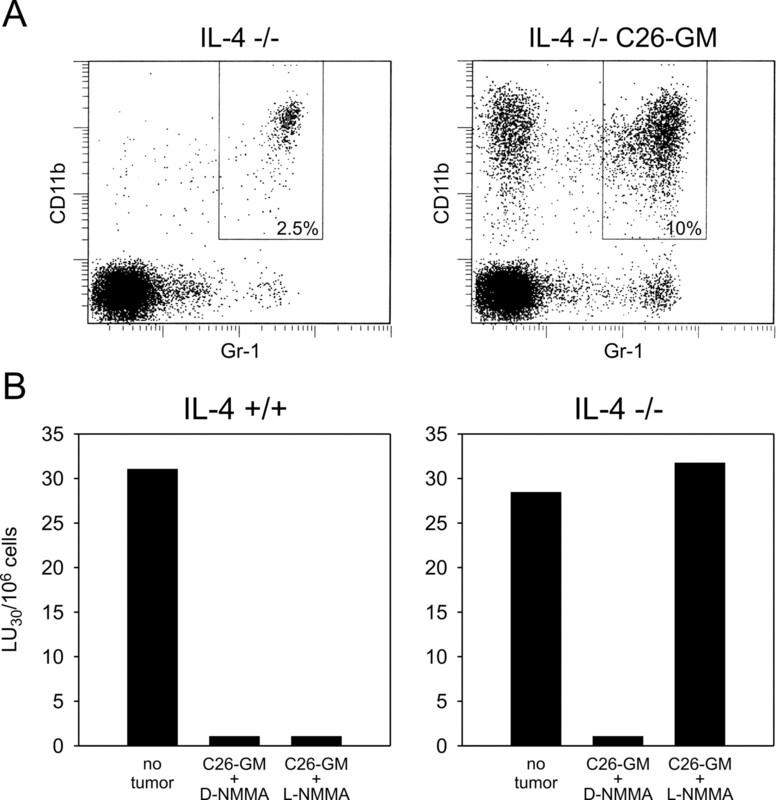 IL-4-treated MSC-2 show enhanced iNOS and arginase activity. OVA-specific Th1 and Th2 clones were cultured in the presence of Ag and IL-2 with gamma-irradiated MSC-2 or MSC-2 pretreated with IL-4 for 48 h (IL-4 treated) at a 1:2 ratio. Supernatants were collected after 24 h of incubation and assayed for NO2−/NO3− content (Griess reaction), while adherent cells were recovered and lysed to test arginase activity. Data are given as mean (±SE) from triplicate wells. To verify the in vivo relevance of the above findings, we moved to a tumor model represented by a GM-CSF-releasing colon carcinoma cell line (C26-GM), whose growth in syngeneic BALB/c mice is associated with a profound impairment of T cell function, which can be completely corrected by Ab-mediated depletion of Gr-1+/CD11b+ cells (Ref. 2 and our unpublished results). This tumor model offered us the possibility to obtain a rapid and reproducible accumulation of MSC in secondary lymphoid organs of tumor-bearing mice. In fact, spleens of BALB/c mice showed a 10-fold expansion in the pool of Gr-1+/CD11b+ myeloid cells as early as 9 days after C26-GM tumor inoculation, with concomitant reduction in the percentage of CD4+ and CD8+ T lymphocytes (Fig. 5⇓A). To characterize the inhibitory population of CD11b+ cells in this tumor model, splenocytes from C26-GM tumor-bearing mice were positively selected with anti-CD11b-coated magnetic beads and cultured in vitro in standard medium for 3 days (Fig. 5⇓B). There was expression of neither of the T lymphocyte markers CD3 and CD8 (not shown), excluding the possibility that enriched CD11b+ cells could comprise activated CD8+ T lymphocytes (19). Similar to the phenotype of MSC isolated in previously described models of tumor-induced immunosuppression (2), Gr-1 marker was prematurely lost (not shown) while other markers for cells belonging to the monocyte lineage stained positive, including F4/80 and CD11b. 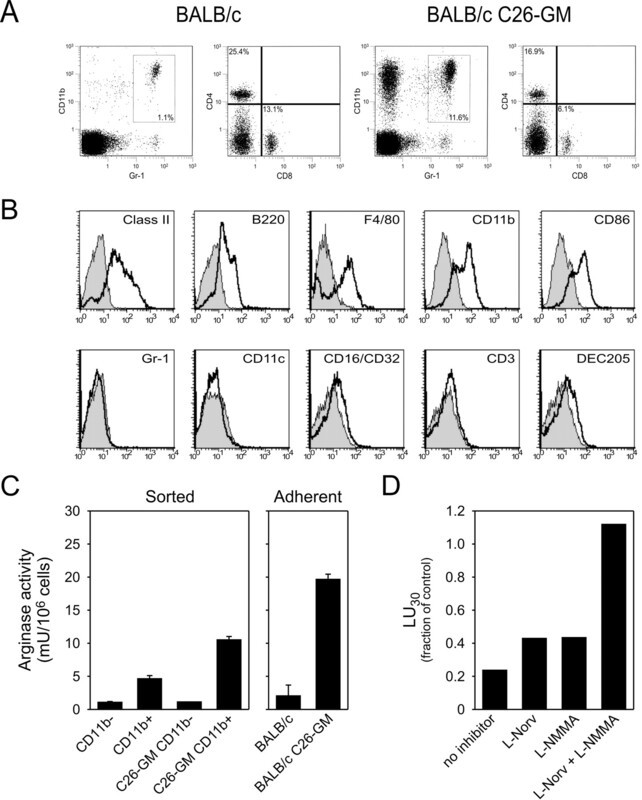 Cultured MSC did not share dendritic cells markers, neither myeloid (CD11c) nor lymphoid (DEC205). There were some minor differences with previously characterized suppressor cells: class II MHC and the costimulatory molecule CD86 were detectable in MSC isolated from C26-GM tumor-bearing mice while CD11c was absent. Moreover, cells expressed low but detectable levels of B220+. It is likely that the phenotypic differences with purified inhibitory cells described in our previous studies reflect the culture conditions (i.e., 7- vs 3-day culture) rather than a real diversity in the two populations. In fact, CD11c, undetectable on the cell surface on day 3, became visible in cells cultured for 4 days; whereas B220, class II molecules, and CD86 were readily down-modulated after day 3 (data not shown). Overall, this phenotypic characterization raises the issue of the intriguing, but yet undefined, lineage connection with the recently identified CD11c+Gr-1+B220+ mouse plasmacytoid cells (20). Arginase and iNOS inhibitors are both required to restore the impaired alloreactive T lymphocyte response in tumor-bearing mice. A, Tumor-bearing mice have an expanded pool of myeloid cells and a reduced number of T lymphocytes in the spleen. Five individual BALB/c mice in each treatment group were injected s.c. with DMEM alone (BALB/c) or DMEM containing 0.5 × 106 C26-GM tumor cells (BALB/c-C26-GM). After 9 days, mice had tumors >1 cm in diameter. Freshly isolated splenocytes were pooled and stained with FITC-anti-Gr-1 and PE-anti-CD11 mAbs, or FITC-anti-CD4 and PE-anti-CD8 mAbs. B, Phenotypic characterization of inhibitory cells from a tumor-bearing animal. CD11b+ cells from the spleens of mice inoculated 9 days earlier with C26-GM cells were enriched through immunomagnetic separation and cultured for 3 days in complete medium. Before staining with the different mAb, adherent cells were collected by gentle scraping in PBS/1 mM EDTA and pooled with nonadherent cells. The phenotypic pattern shown in this figure was also observed in two repeat experiments. Isotype-matched Ab staining is shown as shaded areas. C, Arginase enzyme activity is increased in myeloid and adherent cells from tumor-bearing mice. CD11b+ and CD11b− splenocytes from normal and C26-GM tumor-bearing mice were magnetically sorted and tested for arginase activity directly. Alternatively, splenocytes adherent to the plastic were isolated following 72-h culture from tumor-free and tumor-bearing BALB/c mice before evaluating arginase activity. Data are mean (±SE) of triplicate wells. D, Inhibition of arginase and iNOS activity restores alloreactivity. Generation of alloreactive T lymphocytes was evaluated in C26-GM tumor-bearing mice in the absence or in the presence of l-norvaline, l-NMMA, or both inhibitors. Data are given as fraction of LU30 measured in the allo-MLC from tumor-free BALB/c mice in the presence of the various inhibitors, and normalized for the number of CD8+ T lymphocytes present in tumor-free and tumor-bearing mouse spleens when the allo-MLC were set up. To assess the arginase activity in these cells, BALB/c splenocytes were enriched in the CD11b+ cell fraction by immunomagnetic sorting and directly tested for arginase activity. As shown in Fig. 5⇑C, CD11b+ splenocytes derived from tumor-bearing mice showed a significant increase in arginase activity compared with the same cell fraction isolated from tumor-free mice (t test, p < 0.05; Fig. 5⇑C). Similar results were observed with enriched Gr-1+ splenocytes (data not shown). In addition, a larger difference in arginase activity was evidenced between tumor-bearing and tumor-free animals, when adherent cells were obtained from splenocytes by a simple adherence to plastic, a protocol that is not expected to perturb membrane molecules with latent signaling properties (Fig. 5⇑C). We next asked whether suppression of alloreactive T lymphocytes was an early event during C26-GM tumor progression. As shown in Fig. 5⇑D, at 9 days after tumor inoculation, the number of cytolytic effectors generated in allo-MLC set up with unfractionated splenocytes was only ∼20% of control. However, addition of both l-norvaline and l-NMMA to allo-MLC restored the cytolytic response to levels observed in tumor-free mice (Fig. 5⇑D), indicating that suppression of alloreactive T cells in tumor-bearing mice can also be eliminated by perturbing the biochemical pathways converging on l-arginine metabolism. As shown in Fig. 5⇑, MSC from tumor-bearing mice have an elevated basal arginase activity; however, this activity could be modulated by the cytokines produced by T lymphocytes activated in the allo-MLC. Indeed, IL-4 and IFN-γ were detectable in the supernatants of 4-day allo-MLC set up in the absence of third-party MSC-2 (80 ± 7.8 and 5930 ± 457 pg/ml, respectively), indicating that both cytokines are released by alloantigen-activated T lymphocytes. To determine whether IL-4 released in culture by T lymphocytes might be involved in the suppression of alloreactivity observed in allo-MLC from tumor-bearing mice, we used IL-4 knockout mice (IL-4−/−). The kinetics of C26-GM tumor development was the same in these animals as in IL-4+/+ wild-type mice. Moreover, the extent and kinetics of myeloid cell recruitment in the spleen were similar in tumor-bearing knockout and wild-type mice, although the number of Gr-1+/CD11b+ splenocytes was slightly higher in the tumor-free IL-4−/− mice (2.5% vs 1.1%; compare Fig. 6⇓A and Fig. 5⇑A). The generation of alloreactive CTL was suppressed in allo-MLC set up from both tumor-bearing wild-type and knockout mice, regardless of IL-4 production by alloantigen-activated T cells (Fig. 6⇓B). However, addition of l-NMMA to allo-MLC, which was not effective in restoring the alloreactive response in tumor-bearing IL-4+/+ mice, allowed recovery of alloreactive T cells in IL-4−/− mice, suggesting that lack of endogenous IL-4 leads to a shift from an Arg1- to an iNOS-dependent mechanism of MSC suppression. The same prevalence of iNOS-dependent suppression by MSC has been demonstrated in mouse strains that have a genetically predisposed, dominant Th1 response, such as C57BL/6 (9, 21). In the absence of IL-4, NO production by MSC is the dominant pathway inhibiting T cell function. Three IL-4+/+ and three IL-4−/− BALB/c mice were inoculated s.c. with C26-GM tumor cells or with vehicle alone. After 9 days, splenocytes were collected, pooled, and used to determine the percentage of MSC and to set up allo-MLC. A, Cytofluorometric staining with FITC-anti-Gr-1 and PE-anti-CD11b mAbs of splenocytes from IL-4−/− mice. B, Allo-MLC with IL-4+/+ and IL-4−/− splenocytes isolated from tumor-bearing or tumor-free mice were set up in the presence of the active (l-NMMA) or inactive (d-NMMA) iNOS inhibitor. Results are shown as LU30/106 cells. Allo-MLC from tumor-bearing mice showed the same extent of suppression seen in cultures supplemented with the inactive enantiomer d-NMMA (not shown). The experiment was repeated two more times with superimposable results. Depletion of cytosolic l-arginine in macrophages triggers generation of O2− from the reductase domain of iNOS (22, 23). NBT reduction assay revealed an almost doubled production rate of superoxide anion radical (O2−) in MSC-2 treated with IL-4 (Fig. 7⇓A). However, studies addressing whether induction of Arg1 limits the availability of l-arginine as a substrate for iNOS have yielded conflicting results (reviewed in Ref. 10). To assess the role of Arg1, we investigated whether infection of MSC line with a virus encoding Arg1 could enhance O2− production. When infected in vitro with rMVA, MSC-2-released amounts of NO were comparable to those elicited by treatment with IFN-γ, a stronger inducer of iNOS (Fig. 7⇓B). The ability to release high levels of NO in response to various insults appears to be another unique characteristic of both immortalized and fresh MSC (9, 24), which is not shared by macrophage lines. In fact, RAW 264.7 and J774 cells infected with MVA produced 20- to 50-fold lower amounts of NO than those following IFN-γ treatment (data not shown). 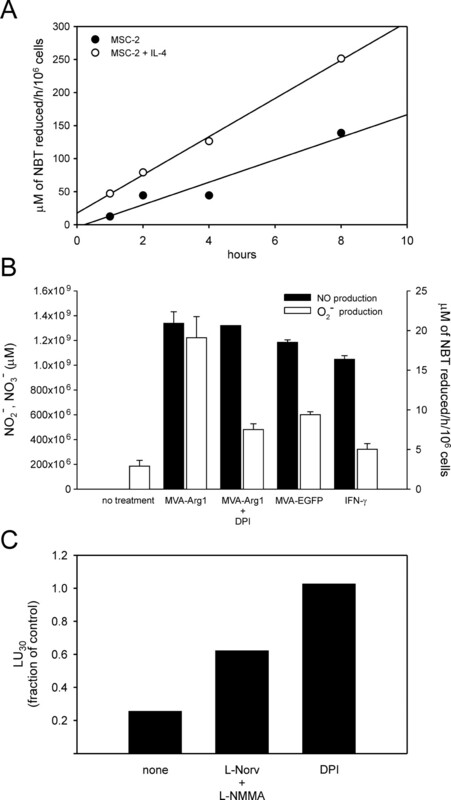 Infection with the MVA control (MVA-EGFP) slightly increased the O2− release from MSC-2, while the contemporaneous expression of Arg1 by rMVA resulted in a 6-fold augmentation in the O2− production rate, which was inhibited by DPI (Fig. 7⇓B), a flavin-binding site competitor that blocks the iNOS reductase domain (23). These findings have functional relevance because the same dose of DPI was more potent than the combination l-norvaline and l-NMMA in correcting the alteration of alloreactive response in BALB/c mice bearing C26-GM tumors (Fig. 7⇓C). Arg1 amplifies superoxide production in MSC. A, IL-4 increases rate of superoxide production in MSC-2. MSC-2 or MSC-2 treated for 24 h with IL-4 were plated in flat-bottom wells and, after 1 h, incubated with NBT. After 1, 2, 4, and 8 h, cells were harvested and superoxide production was determined as described in Materials and Methods. Rates of O2− release were 17 and 28.9 μM of NBT reduced/h/106 cells for MSC-2 and IL-4-pretreated MSC-2, respectively. B, Infection of myeloid cell lines with MVA-Arg1 increases superoxide release. MSC-2 were treated with 5 ng/ml of IFN-γ or infected with either MVA-Arg1 or MVA-EGFP, plated for 24 h, and incubated with NBT for 1 h. During incubation, 1 μM of the flaviprotein inhibitor DPI was added to a group of MVA-Arg1-infected cells. Cells were then harvested, counted, and lysed. Cell-free supernatants were collected for NO2−/NO3− determination. Data are given as mean (±SE) of triplicates. C, The flaviprotein inhibitor DPI restores alloreactivity in tumor-bearing mice. Allo-MLC were set up from tumor-free or C26-GM tumor-bearing BALB/c mice (three per group) in the presence of both l-norvaline and l-NMMA or DPI alone. Data were normalized for each inhibitor and expressed as the ratio between the LU30 measured in cultures from tumor-free and tumor-bearing mice. Data are from one of four experiments with similar results. MSC migrate to lymphoid organs and restrain immune responses during progressive tumor growth and severe immune stress, for example during overwhelming infections (4). In this study, we show that MSC use two mechanisms, both involving the metabolism of l-arginine, to inhibit T cell function. The first mechanism, which requires the generation of NO from l-arginine by iNOS, has been described previously by a number of groups including ours. NO and its derivatives modulate the biological functions of several intracellular signaling proteins including Janus kinase 3, the kinase upstream of STAT5 in the IL-2R signaling pathway (25, 26). T lymphocytes activated in the presence of cloned MSC do not respond to mitogens because the IL-2R-activated signaling pathways are impaired, but not because the ability to produce IL-2 production or to up-modulate the early activation markers CD69 and CD25 is lost. In fact, Janus kinase 3, STAT5, extracellular signal-regulated kinase, and Akt phosphorylation in response to IL-2 is drastically reduced or abrogated (9). The second mechanism of T cell inhibition by MSC has not been previously described, and involves the degradation of l-arginine to ornithine and urea by Arg1. The evidence that Arg1 is crucial for the inhibition of allo-stimulated T cell responses rests upon the observation that, in the absence of NO, two specific arginase antagonists reverse the MSC-dependent block of T cell function. Moreover, the inhibitory activity that is reversed by these antagonists requires IL-4, which induces Arg1 expression in MSC. Both NO and Arg1-dependent mechanisms are used by MSC to inhibit allo-stimulation of T cells. In contrast to NO, Arg1-dependent inhibition blocks IL-2 production and is irreversible (A. Mazzoni, unpublished observation), suggesting that it operates differently from NO in restraining T cell activation. We demonstrated that Arg1 is critical in orchestrating the generation of O2− via iNOS. The inhibition of T cell proliferation in the presence of splenic or bone marrow Gr-1+ cells from tumor-bearing mice was completely reversed by an iNOS inhibitor and a superoxide dismutase mimetic, further supporting the involvement of O2− in the suppressive mechanism (27). In the presence of O2−, NO gives rise to peroxynitrites that drive apoptosis of Ag-primed T lymphocytes by inhibiting protein tyrosine phosphorylation via nitration of tyrosine residues (28). We are currently investigating the role of peroxynitrites in MSC-dependent suppression of T lymphocyte functions. Nontoxic concentrations of uric acid, a widely used peroxynitrite scavenger (29), restored cell viability but not the cytotoxic activity in the allo-MLC set up with splenocytes isolated from tumor-bearing mice (P. Serafini, unpublished results). This split activity suggests an involvement of peroxynitrites in blocking cell proliferation but not in restraining the development of the effector functions of alloreactive T lymphocytes. When the involvement of Arg1 was first discovered, two other possibilities seemed likely explanations of the MSC inhibitory effect. Arginase might suppress T cells either by depleting l-arginine from the medium (thus behaving as the macrophage enzyme indoleamine 2,3-dioxygenase that metabolizes the amino acid tryptophan) (30) or by triggering polyamine production via ornithine decarboxilase. Although ornithine decarboxilase inhibitors did not have any effect on MSC-dependent T lymphocyte dysfunctions (data not shown), l-arginine starvation might be involved, under some circumstances, in direct T cell suppression. One of our MSC lines, MSC-1, constitutively expressed Arg1 and blocked alloreactive T cells through a pathway that was inhibited by NOHA, l-norvaline, or excess l-arginine to the culture without the need for iNOS inhibitors (P. Serafini, unpublished results). Consistent with our data, a profound depletion of l-arginine has been described in the supernatants of allo-MLC suppressed by the addition of excess macrophages, and a complete reversal of the suppression was observed when the medium was supplemented with l-arginine (31). Those studies also revealed a marked increase in arginase activity in peritoneal cells activated by thioglycolate and in spleen activated by a graft vs host reaction. It is not clear whether l-arginine depletion occurs in vivo, but decreased levels of the amino acid have been detected in wounds and in patients with acute bacterial peritonitis (32, 33). Bacteria might also exploit l-arginine depletion as a strategy for survival. Helicobacter pylori gene rocF encodes a constitutively expressed arginase that consumes l-arginine from the medium and entirely prevents NO production by iNOS (34). Whereas wild-type H. pylori is not killed by macrophage-derived NO, rocF-deficient strain is efficiently eliminated by activated macrophages. MSC do not release suppressive molecules in the presence of resting T cells. In fact, MSC serve as sensors of T cell activation, and only activated T cells induce both suppressive pathways. Interestingly, each pathway is stimulated by a distinct signal. NO-dependent suppression requires IFN-γ plus contact between T cells and MSC (9), whereas Arg1-dependent suppression requires IL-4 plus cell contact. Thus, as we have shown, Th1 cells (which secrete IFN-γ) induce NO, but not Arg1 activity, whereas the reverse is true for Th2 cells (which secrete IL-4). However, this dichotomy must be reconsidered in light of the finding that a prolonged exposure to IL-4 also triggers a substantial iNOS activity in MSC. IL-4 is not the only molecule with such properties because LPS was also shown to induce Arg1 and iNOS, but not Arg2, in rat peritoneal macrophages (35), suggesting that there are circumstances under which the two enzymes can be active at the same time and in the same intracellular environment. Interference with MSC suppressive activity has been shown to restore normal immune function in tumor-bearing hosts. The resection of a mouse fibrosarcoma led to a decrease in the number of Gr-1+CD11b+ MSC, corrected the p56lck abnormalities in peripheral T lymphocytes, and restored antitumor immunity because the mice were able to reject a second challenge with the same tumor (36). In a different approach, treatment of immunocompetent mice with mAb that depletes Gr-1+ cells was sufficient to reduce the growth rate of a UV light-induced tumor and to enhance the antitumor T cell response (37). Surgical excision of a tumor is not always feasible and the use of depleting mAbs is not specific, because it eliminates mature granulocytes and exposes the chronically treated host to opportunistic microbial infections. Thus, l-arginine metabolism in MSC might be an excellent molecular target for a novel class of immunoregulatory compounds in the tumor-bearing hosts to restore a functional immune system and increase the efficacy of cancer vaccination. We thank Pierantonio Gallo for assistance with graphics, and Vito Barbieri for the experiments involving mice. ↵1 This work was supported by Ministero Italiano della Ricerca Scientifica e Tecnologica, the Italian Association for Cancer Reseach, and the Italy-U.S. Cooperation Program for the Therapy of Cancer (Grant T00.A17). G.S. was supported by the European Union (BIO4-CT98-0456) and the Deutsche Forschungsgemeinschaft (SFB456-B7). C.D.-S. was supported by a fellowship from Nicox S. A. (Sophia Antipolis, France). ↵2 V.B. and P.S. contributed equally to this work. ↵4 Abbreviations used in this paper: MSC, myeloid suppressor cell; Arg1, arginase 1; Arg2, arginase 2; iNOS, inducible NO synthase; NOHA, N-hydroxy-l-arginine; MVA, modified vaccinia virus Ankara; DPI, diphenyleneiodonium; NBT, nitroblue tetrazolium; CEF, chicken embryo fibroblast; EGFP, enhanced green fluorescent protein; l-NMMA, NG-monomethyl-l-arginine; d-NMMA, d-monomethyl-l-arginine; LU, lytic unit.